Darling loves bitter gourd so he thinks his Junior has too favour bitter gourd like him. He has been pestering me to let Jonathan boy try out bitter gourd. I was a bit reluctant cause from the name you already know it’s bitter so do you think a baby would like it? I, myself don’t like bitter stuff. I only take bitter gourd if it is cooked with scrambled egg, tau chu (fermented soya beans) or deep fried (for banana leaf rice). They say bitter is good. That’s the reason all medicines are bitter especially chinese medicines. So here, I bought the baby bitter gourd. I cut into thin strips so that at least if Jonathan boy dislike it, I can put aside the bitter gourd but give him the porridge only instead. 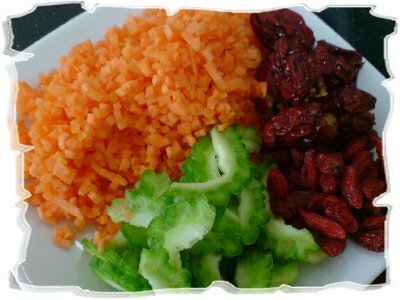 I put in some diced carrot and wolfberry for the colour. I also added red dates to give some sweetness to the bitterness. Since this is a first try, so no fish is added otherwise some fish or meat will provide additional nutrients. I tasted the porridge myself before giving it to Jonathan. Bleeek…it’s bitter. For that moment I thought the porridge will go to waste. First try…give him the porridge first and he swallows it. Second try…give him the bitter gourd and he chews it. Lastly…he finished everything as though he has lost his taste bud. Since Jonathan boy can accept the bitter gourd, I chopped the bitter gourd on my next try so that it mix well with the porridge and I added some fish too. I read from some articles that to reduce the bitterness, the bitter gourd is salted and exposed to direct sunlight for few hours. After few hours, its salty, bitter water is reduced by squeezing out the excess by hand. Then rinse with water a few times. I’m going to try this method on my next cooking. So, happy trying! This entry was posted on Monday, November 10th, 2008 at 1:48 pm and is filed under Jonathan's Meal. You can follow any responses to this entry through the RSS 2.0 feed. You can leave a response, or trackback from your own site. Wah, he’s very adventurous in trying new food. My kids never like bitter taste, so they won’t eat the gourds. 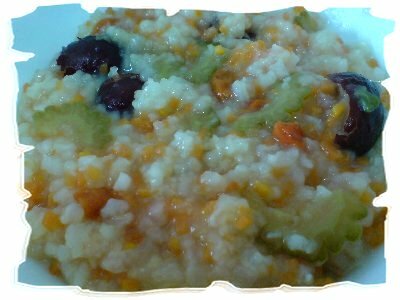 Never try bitter gourd on Ji Hin’s porridge. Same as you, don’t like bitter. I guess as long as the mixture is nice, any toddler will like it. Wow…talk about genes! And talk about being brave in making new food. And talk about trying and accepting new food. And talk about healthy. Really really good! Will try with my little boy too. i love bitter gourd too, just had them with egg for dinner just now…yummy! havent tried on rachael yet though…it’s good you’re experimenting a lot of variety of food for jonathan…hardworking mummy! good job! Poor boy. Hari-hari jadi white mice. hmm… jonathan is sure one adventurous champ when it comes to eating. my son nowaday a bit picky, not sure whether he would like this or not…will try next month then!! i am amazed he is willing to eat bitter! it never crossed my mind to let keira try, but it is good training so he will be more adventurous eater next time. Wow.. Jonathan can accept bitter gourd… very good!! Will try it on my boy too, hope he likes it! Just managed to check out your blog . Remember me? U dropped by my boy’s blog (Jonathan too) a few weeks back. wow,he really has unique taste bud! Good la, means that he is not a fussy eater! Ann, Yugene – Let me know if your baby likes it. June – No choice…getting bored with the same ingredients each time. Aunty Next Door – Your kids want to join the white mice team? Merryn – I’m going to let him try the scrambled egg with bitter gourd soon. MC – I’m trying to train him not to become a fussy eater. He should eat what the adults eat. Pet – Thanks for dropping by our Cyberhome. Hope to see you more here. Jazzmint – Look out for the next experiment…something red. I hope it’s not chilli. Anggie – Jonathan did the “vomit” act when I gave him avocado. Wowww! A “brave and dare” try for you Julie. If me, I will sure not dare to put bitter gourd into the porridge. I like bitter gourd too, but too bad my husband dislike it, therefore I do not know much about how to cook bitter gourd. Anyway, Jonathan is a good boy. He is not picky in terms of food.